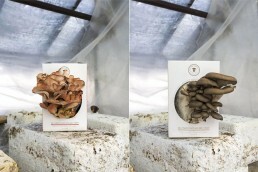 As the name indicates, Funghi Espresso starts by growing mushrooms on coffee-waste according to the blue-economy principles. Yet these guys know that the possibilities don’t end there. After growing oyster-mushrooms, there’s still A LOT of valuable resources that can be used to grow more food or upcycle it to useful products. We are extremely lucky that Funghi Espresso understands that in order to make this world truly sustainable, we need to share and cooperate. Hence, they agreed to join a Google Hangout where they gave a presentation and where many people asked a lot of questions. The sessions hosts were Zjef Van Acker & Alessandra Varotto. The session was organised on Tuesday 13th of November at 14.00 CET (Central European Time), live from Florence, Italy.